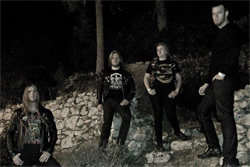 After several demos and an EP, Sweden's Void Moon release their first full-length album On the Blackest of Nights on the Cruz Del Sur label. 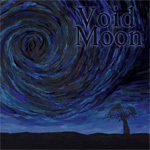 The album title is appropriate as Void Moon offers some deep, dark, and heavy doom metal. Void Moon:: in the black of night. Void Moon isn't reinventing the wheel as much as channeling the peers that defined traditional epic doom metal: Black Sabbath, Candlemass, and Solitude Aeturnus. They're on the right track with a foreboding atmosphere laced with traditional guitar work and powered by a deep and menacing rhythm section. The wild card may be Jonas Gustavsson vocals which are basically raw, raspy, and then get grating after about the second song. Sometimes Void Moon gets 'frisky,' stepping up the pace as it were, on songs like Hammer of Eden and the later Through the Gateway. Generally, its mostly that gloomy plodding side of doom metal. However, while a good effort, Void Moon is not a match for stronger peers like Candlemass. Nevertheless, fans of doom metal looking for modern purveyors, with some equivalence to Hammers of Misfortune and Grand Magus, should check out Void Moon. Fans of doom metal looking for modern purveyors of the craft, with some equivalence to Hammers of Misfortune and Grand Magus, should check out Void Moon.